While they might be an unusual sight in rural locations, their big yellow counterparts excepted, buses are an important part of the transportation network in cities and tourist destinations. In some ways, buses are a cross between a large truck and a passenger vehicle, carrying the heft of the larger vehicles with the precious cargo of a packed car. Last week’s San Francisco tour bus accident has many taking a closer look at this special mode of transit. Our San Francisco bus accident lawyer remains ready to help victims of any bus accidents in the Northern California region including passengers, occupants of other vehicles, and bystanders alike. Earlier this week, NBC’s Bay Area affiliate provided an update on last week’s frightening Union Square crash involving a tour bus. On Friday November 13, a tour bus plowed into a bicycle rider and hit multiple cars before crashing into scaffolding at the Union Square Apple store. The incident left 20 people injured with three still in critical care and two listed in serious condition as of Monday. Thus far, a city representative says the police suspect mechanical failure led to the crash, adding “This was 100 percent preventable if there was good recordkeeping and good maintenance reporting.” She also said she would like the city to take over regulating city tour buses. NBC now reports that the state’s Public Utilities Commission (“PUC”) says that the bus’s license plates did not match the vehicle and actually belonged to another bus from the same company. Further, the PUC states that there is no evidence the bus underwent required inspections nor had the company told the PUC they were adding a bus into service. Per NBC, the agency spokeswoman also stated that various law enforcement agencies are working to determine if the plate switch was a deliberate attempt to avoid inspection rules. Meanwhile, the company released a statement saying they inspect their vehicles at least every 45 days and that the vehicle involved had been inspected last month and is registered with the DMV. According to the 2015 Pocket Guide to Large Truck and Bus Statistics, published by the Federal Motor Carrier Safety Administration (“FMCSA”), buses travelled 15,167 million miles in the U.S. during 2013, a figure that has been steadily rising in recent years. The pamphlet states there were more than 5.6 million total crashes nationwide in 2013 with some 66,000 involving buses. Breaking these numbers down further, out of 30,057 fatal crashes nationwide in 2013, 280 involved buses and out of more than 1.59 million injury-causing crashes, 18,000 involved buses. Overall, the FMSCA reports that 310 people died in bus crashes in the U.S. during 2013. Bus accidents often epitomize the lack of control felt by anyone involved in an accident that was not his/her fault. 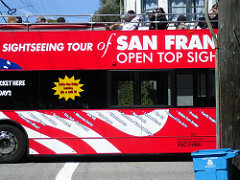 As a San Francisco tour bus accident law firm, we can hone in on the cause of accidents and discover where fault lies. Whether a bus accident is due to a careless company, a negligent driver, another party, or, as is often the case, some combination thereof, we can help the injured and grieving recover compensation for an accident caused by someone else’s negligence. Contact us at (800) 427-7020 or via our electronic form to arrange a consultation with our experienced accident attorney.